In addition to being able to create a quick and easy playbook using the FastPrint feature, you also have the option of creating a new, blank playbook that you will be able to fully customize. You can begin this process by clicking the "New Playbook" button from within the Playbook Tab. After naming your playbook and first chapter, your playbook will open in the center window of the Playbook Tab, which is the Playbook Editor window. From your Play Library window on the left side of the screen, you can drag and drop plays from your library directly into the Playbook Editor window to add them to your playbook. Any plays in your playbook can also be dragged up or down in the window to change the order that they will appear in. 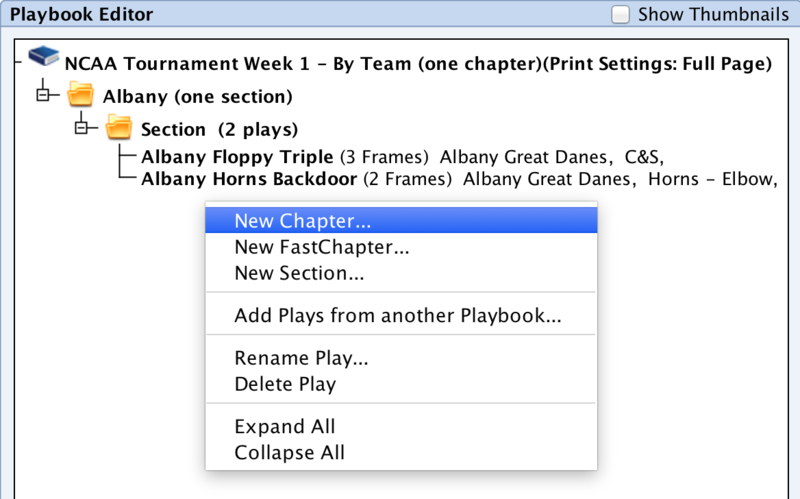 Chapters and sections are the main dividers and organization tools available within a playbook. Chapters are most often used as a way to organize different kinds of plays sets within a playbook. For example, your Offensive System playbook might include a chapter for Motion Offense, a chapter for Quick Hitters, and a chapter for Zone Offense. To add a new chapter or section, simply right-click anywhere within the Playbook Editor window. A Chapter or Section can be renamed from the right-click menu. Just like you can click and drag plays to rearrange them, you can also click and drag plays from one Chapter or Section to another. Delete Plays - Right-click on any play to access the Delete Play option.